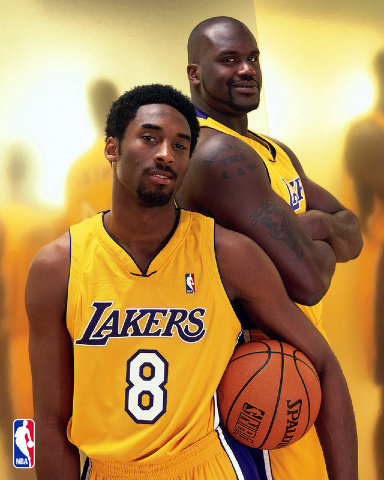 This week versus the LA Clippers, Lebron James proved that he is a lot more Shaq than he is Kobe. Between Kobe’s 5 rings and Shaq’s 4 championships, they have been key members of the basketball royalty over the last 15-20 years. One thing that I have expressed over the years, when the Kobe haters and I get into debates, is that Kobe was always option 1. First in his mind, than in the minds of Phil Jackson, the Lakers coaching staff and the rest of the league. Why you ask? Because the main reason that Kobe is so polarizing is because you can’t tell him he is not the best that has ever done it. Not when he was bald headed, wearing number 8 shooting air balls versus the Utah Jazz before they won championships, or now in his 16th year in the league, put together, literally, with tape on a damaged wrist and (God knows what) in his knees. He is simply a “killer” in the vain of athletics and winners. On the other hand, there is Shaq. Now before you guys start bugging out, pulling up Youtubes of him breaking baskets and catching alley oops, I want you to think about the personality of Shaq. Very jovial, fun-loving Shaq. The pitchman. Superman. Kazaam, and all the other names he’s coined for himself. The difference between Shaq and Kobe? Kobe’s only names he’s known by besides his own are Black Mamba (http://en.wikipedia.org/wiki/Black_mamba) and some other names that because they are profane, won’t make it on this blog. Their off the court personalities tend to match their on the court personalities. Although Kobe is probably never the leader in FT percentage on his team, he is always the one who steps to the line to shoot the techs. Why? Because in his mind, there is no one better to handle the pressure. On the the other hand, Shaq’s futility at the free throw line helped coin a phrase (Hack-a-Shaq) that has been adapted to use on many big men, with the inability to come through in the clutch at the line. Just last night, the new age Superman, Dwight Howard, set a new record in most FT’s because he hits less than half of them, night in and night out. You see, during the great Lakers run that featured Shaq and Kobe (and the Heat run with D. Wade for that matter), the big fella was no good to his team most of the time in the last 6-8 minutes of close games. Why? Because passing him the ball was in most cases a “lost possession” because he couldn’t get past the mental hurdle of standing at the line, with everybody looking at him to sink the big shots. Kobe has never had that problem, whether at the free throw line, or fading away with three 6′ 8″ plus defenders using every inch to block his game winning heroics. So what does this all have to do with King James? The anointed one? Well since he has come into the league, the pundits have tried to find who Lebron is most like. His game is truly like no other, that I can recall. He’s built like Kevin Willis, is fast and powerful offensively like Karl Marlone, can handle the rock and score, like Jordan and pass like Magic. What he doesn’t have is the heart of a champion. At least he hasn’t shown it yet. If I had to pick a player on the Heat that has shown that, its D. Wade…hands down. 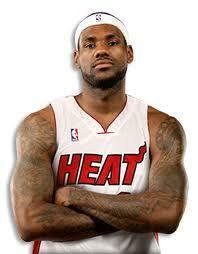 No one with the ability of Lebron James, should defer to anyone unless its an Olympic Dream Team roster. But this isn’t NBA 2k is it? This is real basketball. Although Magic could have only dreamt of having the overall athletic ability of Lebron, King James still hasn’t achieved what Earvin achieved based on a killer instinct that drove him to move from PG to C his rookie year to win his first championship, or channel is inner Kareem with the running hook to beat the Celtics in the eighties. Yet, in this era of intense media scrutiny that only Jordan could probably relate to, Lebron still seems to fall short. As Lebron has become the pitchman, that sells you everything from shoes, to sodas to insurance he still hasn’t sold himself that he is truly, “the man”. We all know that he has WAY more ability than is needed to make it happen. What he has not exhibited yet is the killer instinct to close the deal. Maybe he needs to sit back and take the lead from someone who has already done it. His teammate, D. Wade. The one with the proven…killer instinct. NBA Champion 2006. Lebron still has time to win at least one or more championships. Not sure about the 6 to 7…that may be a stretch. He just may need to be Shaq or even Pippen. Putting up big numbers in a support role. Theres no harm in that. The NBA Finals have come and gone. It was by far one of the most compelling series that I have witnessed over the last 30 years of watching hoops. The games had compelling storylines, starting with the Big 3 Vs. Dirk, to Dirk winning despite flu-like symptoms and D. Wade returning from injuries. All 4 of the first games came down to a win or lose on the last shot! What drama! When the dust settled, the winners were the better team. The Dallas Mavericks. A team made up of guys like Jason Kidd, Shawn Marion, Jason Terry, Peja Stejakovic and of course the Finals MVP, Dirk Nowitski. All guys who came close over the last 10 years, but couldn’t get past teams like the Lakers, Spurs, and Celtics. Congratulations to them. 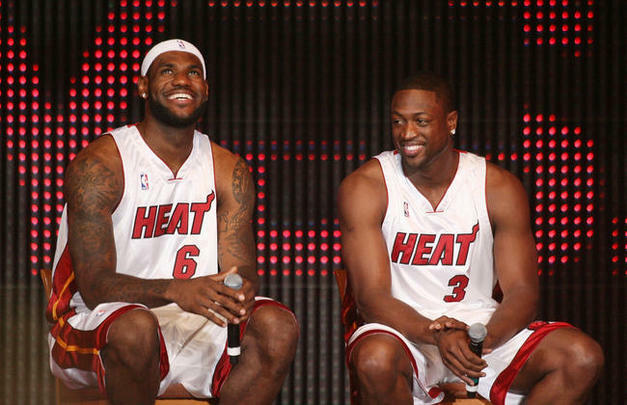 Alas, all the media, pundits and average “fly by night” fan wants to talk about is that Lebron and the Heat lost…period! Not about how great The Mavs played but how the Heat lost. Its like children on a playground pointing and laughing at the kid that trips and scraps his knee, or the high school pot head, who laughs at a kid who drops a touchdown pass or misses a dunk in the big game. Its a bunch of wanna-bees hating on the people that are doing it. To me its quite pathetic. People focusing on peoples “failures” than on their “victories”, when they aren’t good enough to be in the game in the first place. There are people who never watched basketball, who watched the Finals praying that the Heat lose. That was it. They watched for no other reason. The Networks loved it! The advertisers loved it! The ratings on this years finals were way up(http://sports.espn.go.com/nba/truehoop/miamiheat/news/story?id=6656975.) There was plenty of product sold, because of this years finals. Yet according to CNBC, Lebron’s image may never recover (http://www.cnbc.com/id/43377649/LeBron_James_Marketing_Might_Never_Recover). That may be true, but Lebron on his worse day will out sell anyone on the Mavs roster and will only be challenged by D. Wade on the Heats roster. Lebron and his family will be fine. The bottom line is, almost a year removed from “The Decision” (that raised $5 Million in in scholarship money by the way), people need to let their hate go. Criticize him for his lackluster 4th quarter performances, not making his team better down the stretch, etc but because he supposedly “dissed” Cleveland? Please stop. In a word its “pathetic.”.